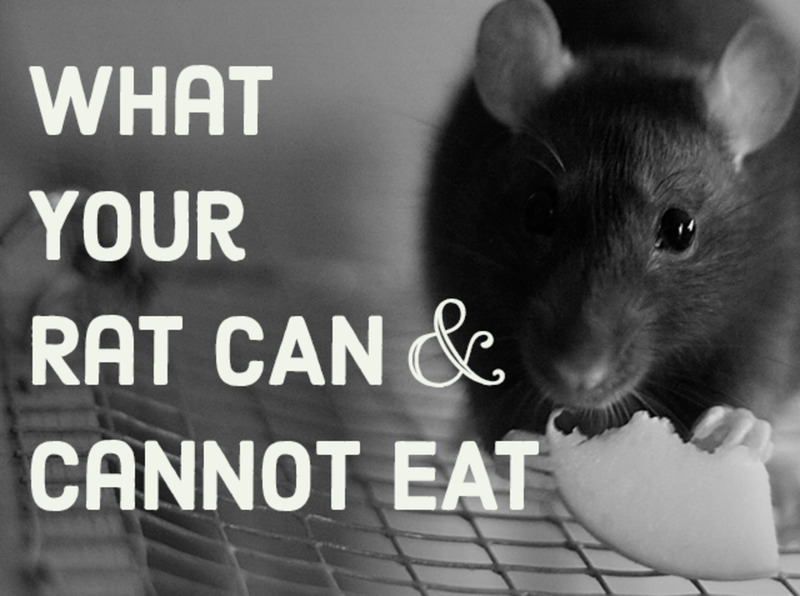 I Love Homemade Things—And So Do Rats! I absolutely adore rats and I love to pamper them. However, I found that store-bought cages, beds, toys, accessories, food, and treats can be expensive and limited. The hammocks and beds I find in pet stores tend to be quite plain and often not the best quality (they fall apart immediately after ratties start to chew on them). Little by little, I have learned how to make all kinds of homemade things for my pet rats, and now pretty much everything I have for my rats is homemade. 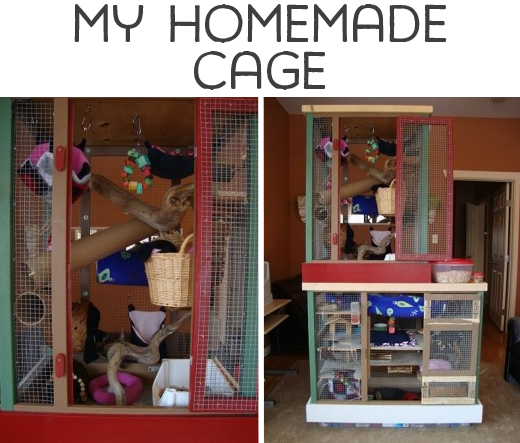 Making things yourself not only will save you money, but is also really fun and allows you to customize your cage. I've written basic instructions for most of the items pictured. However, the purpose of this page is more to give you ideas of the types of things you can make rather than to list complete step-by-step directions for everything. I tried to give detailed instructions for one of each type of accessory so that they can be generalized to the others. However, if there is something you wish to make that is unclear, please leave a comment and I would be happy to give more explicit directions. 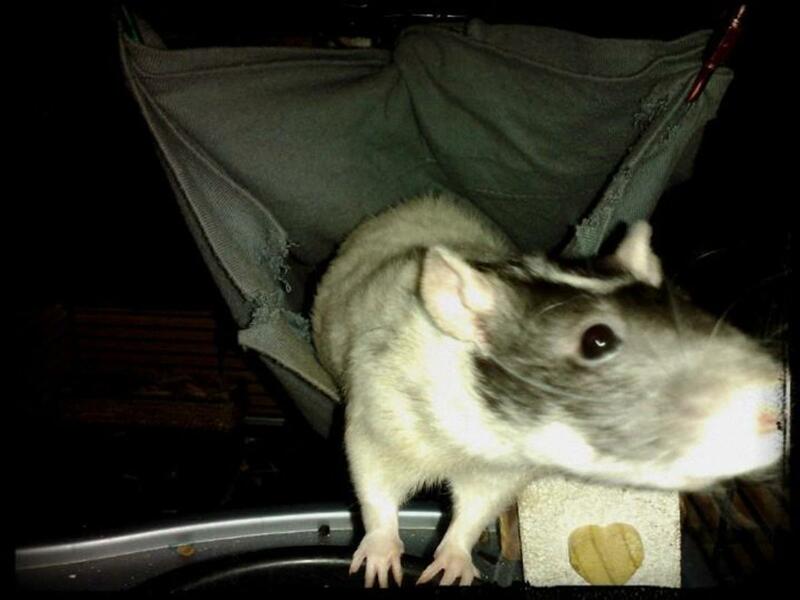 Hammocks are one of the easiest accessories to make, as well as one of the most loved by rats. Simply cut two squares of fabric and sew them together with the right sides (or sides you eventually want showing) facing one another. Stitch around the perimeter, leaving a small gap so that you will be able to pull the right sides out afterward. Flip it right-side-out, then sew up the gap, and you are done! To make your hammock easier to hang, you should pin small loops of fabric in the corners before sewing the two squares together. 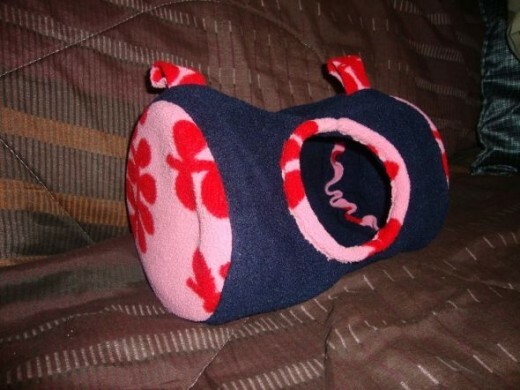 To make it fancier, you can cut a hole in the top layer so that your rats can snuggle inside. When I do this, I use three pieces of fabric instead of just two so that the bottom is still thick when the rats go inside. If you are not a sewer, simply cut a square of fabric and attach it to your cage with strong safety pins. 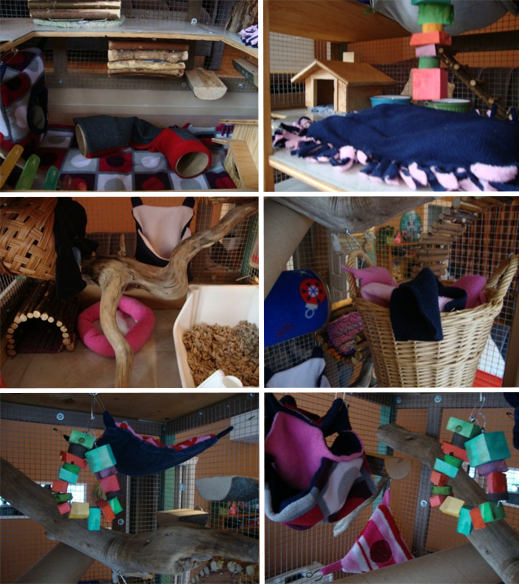 Triangular hammocks are a great way to make use of the corners in your cage. 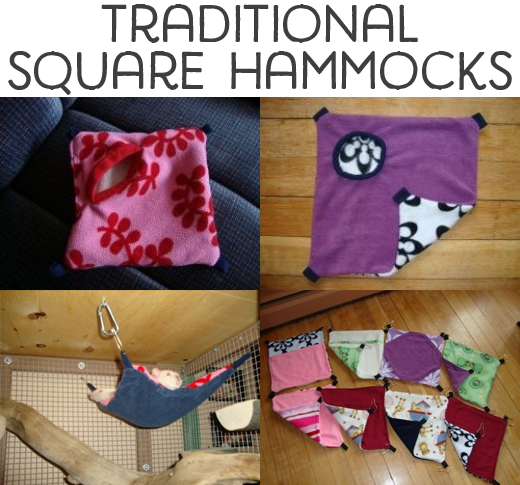 Make these hammocks the same way as the square ones; just use triangular pieces of fabric instead of squares. Honeycomb hammocks look so cool and are so much fun for rats, and all they are is just three regular hammocks sewn together. 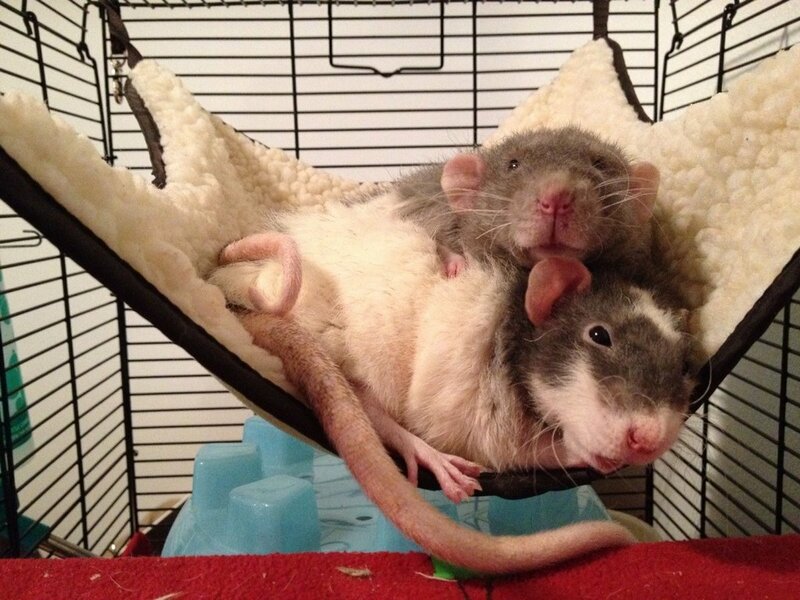 Rats can lounge on the top or snuggle inside either two bottom layers. Surprisingly these hammocks are quite easy to make. First, sew three separate square hammocks of different sizes. Then, sew the corners of the biggest hammock to the sides of the second biggest hammock, and the corners of the second biggest hammock to the sides of the smallest hammock. 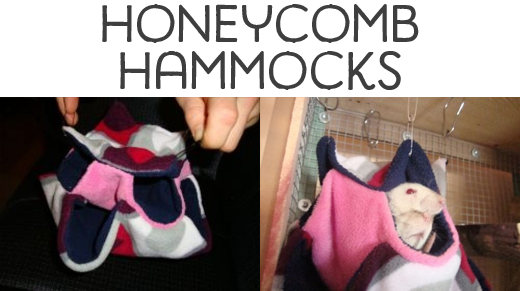 Finally, hang the honeycomb hammock by the corners of the smallest hammock. You could sew the corners of each hammock to each other (instead of to the sides) for a different look, but I like the look of this one better. Hanging beds are a cozy alternative (or addition) to hammocks. There are many different shapes you can make, but I recommend trying the cube ones first, because once you know how to sew these, you can pretty much figure out how to sew any other shape. Tip: Smaller cubes hold their shape better. I find that cutting six-inch squares of fabric makes a good-sized cube for two full-grown rats. See the photo gallery below for other ideas for hanging beds. A cylinder-shaped bed. I sewed two hard plastic rings into the ends to help maintain its shape. I made this cube out of scraps of faric, quilt-style. It takes a bit more time, but it's a great way to use up small left-over pieces of fabric, and it looks cute. This house has two levels, which are connected by a small hole on the inside. 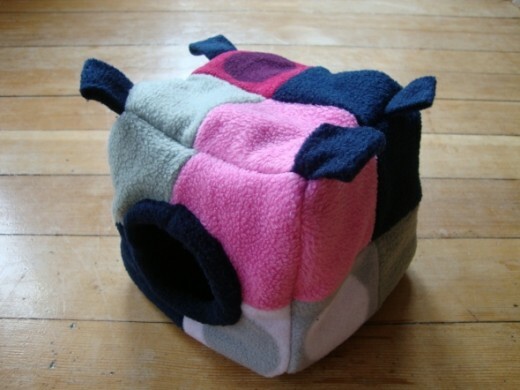 This cube was the first one I sewed. It turned out to be way too big, so I turned the top into a hammock. 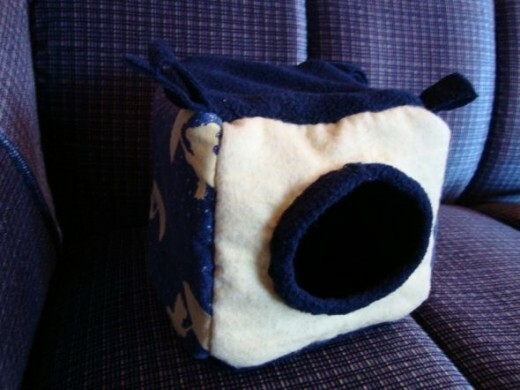 The rats can crawl from the cube up to the top, and can snuggle under the top layer of fleece. This has exactly the same pattern as the regular hanging cubes, except that it is tied together instead of sewn. Also, it is only one layer thick. This is a great way to make a cozy bed for people who don't like sewing and people who just like the look of the fringe (which I do). The great thing about making our own rat accessories is that you can make items that match your hammock. Here's a Halloween-themed hammock set. 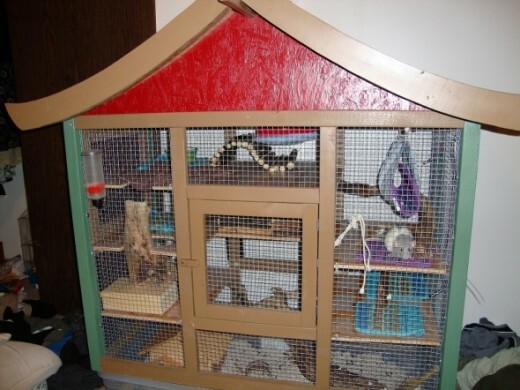 For more more detailed look on how you can completely deck out your cage for a theme, check out my article Decorate Your Rat Cage for Halloween. Hanging beds are awesome, but it's also nice to have some beds that sit on the levels. Here's how. To make the bed A pictured above, sew together two circles of fabric, with the right sides out. Then cut two long rectangles of fabric; you want the length of the rectangle to be a bit longer than the circumference of the circle, and the width of the rectangles to be a bit more than you want the height of the bed walls to be. Sew the long sides of the rectangles together with the right sides in. Then turn it right side out so you have a long tube. Sew this to the edge of the circle and then stuff the tube (I like to use all of my scrap bits of fabric for stuffing). Finally, sew the edges of the tube closed. You may also want to stuff the bottom circle if you fabric is not very cushy. If you do this, stuff it after you have sewn it onto the rectangular tube. I made this bed the same way as bed A, but I made the sides taller and did not stuff them. To make this bed, I sewed together two circles for the bottom, leaving a small gap for stuffing later. I then sewed together two other larger circles for the roof, again leaving a gap for stuffing later. I cut a hole in these two larger circles for the door. Next, I sewed the larger circles to the smaller circles, sewing with the right sides together so the seams would not be seen. After the bed was pulled right side out, I stuffed both the top and bottom of the bed and sewed close the gaps. This bed is so warm and cuddly. Here's another very cozy bed. It's similar to bed B, but with one side smaller than the rest, creating an entrance. 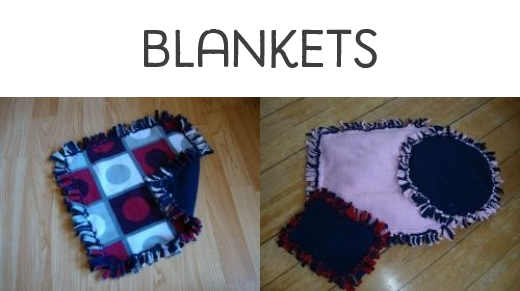 To make this no-sew blanket, simply cut two squares of fabric (fleece works best), cut roughly two-inch squares off of the corners, make snips about two inches in all along the edge, and then tie the fringe of the squares together. To make a cushion, simply stuff the blanket before completely tying the two pieces of fabric. Tip: These can be hung up as hammocks. You can cut a hole in the top layer so that the rats can crawl inside. Tent A was one of the first things I made for my rats years ago, and they still use it (although now there is a small rat-made hole that one of them likes to spy out of). I made the frame from a coat hanger and wooden dowels. Then, I just sewed a piece of fleece around the frame. I made this tent B in a similar way as the hanging cubes—here are step-by-step instructions. To keep the tent upright, I used wire from two coat hangers. 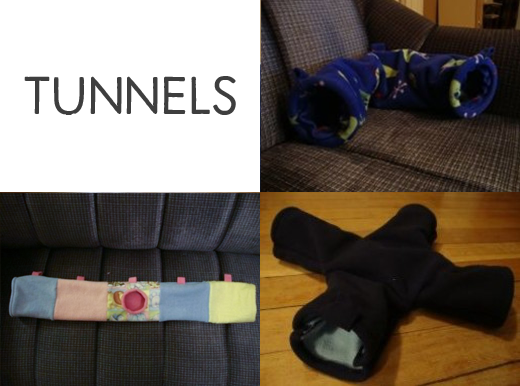 Fabric tunnels are versatile and easy to make. What's more, the rats love them. They can be used as beds, ladders, and walkways. To sew a tunnel, cut a long rectangle of fabric. Hem the edges of the short sides of the rectangle by folding them over and sewing them so that no rough ends of fabric are visible. Then fold the rectangle in half (like a hot dog, not a hamburger) so that the right sides are together and sew along the long side. Then turn your tunnel right side out and you're done! To make a hanging tunnel, pin in loops of fabric before sewing the rectangle along the long side. For the tunnel on the lower left, you can see the sewn-in loops. I also sewed in hard plastic rings so that the tunnel would stay open, but this isn't necessary. The 4-way tunnel on the bottom right has loops so it can be hung up. The center is big enough for a rat to sleep on top or inside. I made this ring by following the excellent directions at Suz' Sugar Gliders. I made this chew/treat toy the same way as toy A, except that I used a square piece of cardboard instead of a wooden ring. I also tucked in some treats as I was tying the fabric closed. 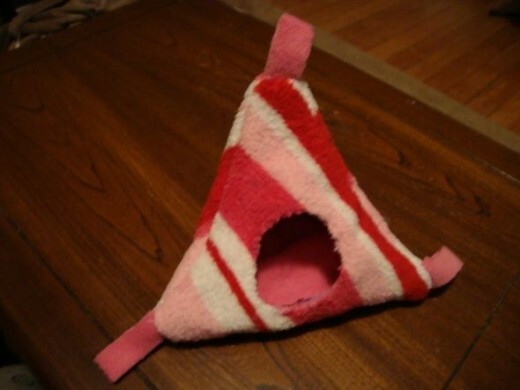 I made this treat toy by cutting out two circles of fabric and tying them together (using the no-sew method). I stuffed it with shredded paper and small dry treats. This is a mini no-sew cube, which I stuffed with shredded paper and dry treats. 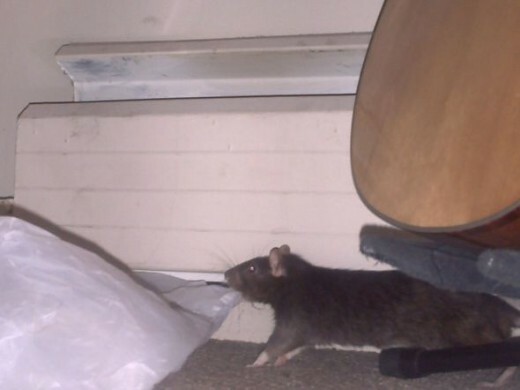 Bean bags can be used to help cool down rats in the summer or to warm them up in the winter. 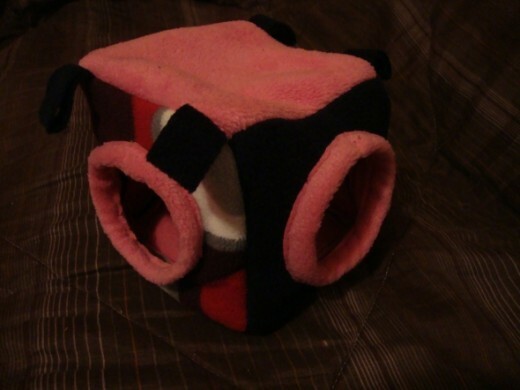 The bags are especially useful if you have sick or lonely rats because you will want to help them stay warm. Simply sew together two squares with the right sides together, leaving a small gap for filling. Turn it right side out and fill it with dried beans, rice, or other grains, and sew the opening closed. 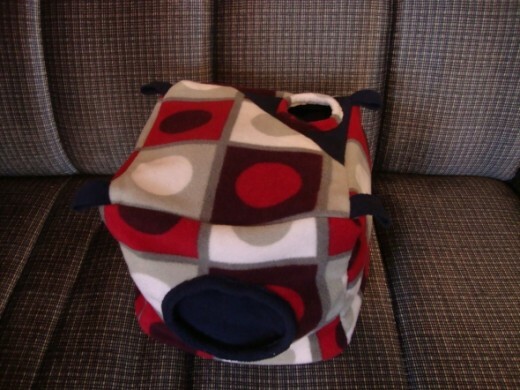 The bean bag can be heated up in the microwave (or oven) or cooled down in the freezer. Tip: If your rats like to chew, you might want to double the thickness of the fabric. Bonding pouches are very useful. They can be used to help socialize baby rats, to comfort sick or lonely rats, or to just spend more time with healthy rats. When rats have a cozy bed to sleep in close to your chest, they will feel safe and comfortable. If you have baby rats to socialize or sick or lonely rats to keep company, consider making a rat carrier. Here's a more detailed guide on how to make one. Cut long strands from a pair of jeans and braid two long segments for the sides of the ladder. Sew three unbraided strands of jean to one of the long braided segments. Braid the strands to the width you want your ladder to be. Repeat steps 2-4 for each rung of the ladder. If you don't like sewing, you can probably find a way to just tie the rungs on. You could also try using other fabrics, but braided jean is probably the sturdiest. 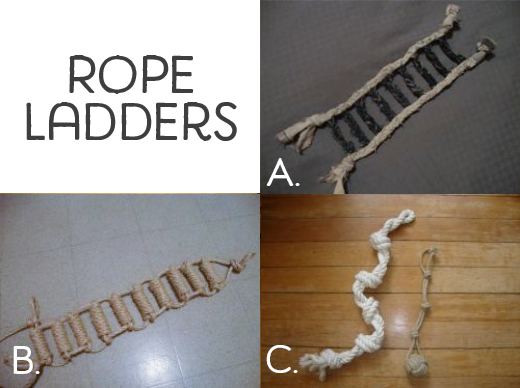 I made this rope ladder by following the directions on Wikihow. Just make a mini version! However, because you need a lot of rungs you still need a fair amount of rope (I think I used about 35 feet to make this one). Here are some more climbing rope toys. The one on the left is just a thick piece of rope that I twined and knotted. The one on the right is all a monkey fist knot—if you've never made one, here's a video tutorial. 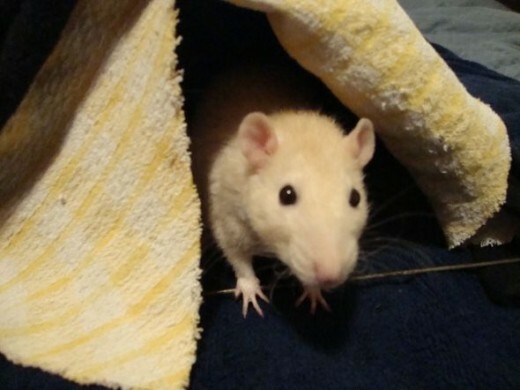 An easy way to make a nice long climbing rope for your rats is to use an old bed sheet. I bought this one for two dollars at a second-hand store. Just cut the sheet into three long strips and braid it, tying knots at each end. Then fasten it up in your cage! 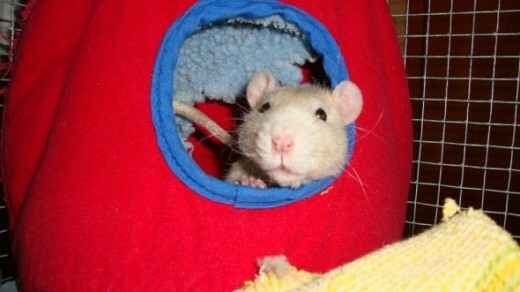 Rats like teddies too! Ok, so rat owners probably like rat teddies more than the rats do. But it's so cute to see a rat hold a teddy bear. To make one, draw the outline of a simple bear on paper. Cut it out and trace it twice onto fabric (fleece or felt). Then, cut out the two pieces of fabric. On one piece sew on a face. Next, put the two pieces together (with the wrong sides together as it's too small to turn inside out) and sew along the edge leaving a gap for stuffing. Stuff the bear and then sew up the gap. Your rats will probably want to chew it up but hopefully you can get a few cute pictures before it's completely destroyed. Ice cream buckets make great, simple houses for rats. Just wash them and cut out an entrance. If your rats are into chewing/eating plastic, you can just use these in your rat's free range area. For more ideas on setting up a free range area for your rats, check out my article Creating a Pet Rat Play Area. 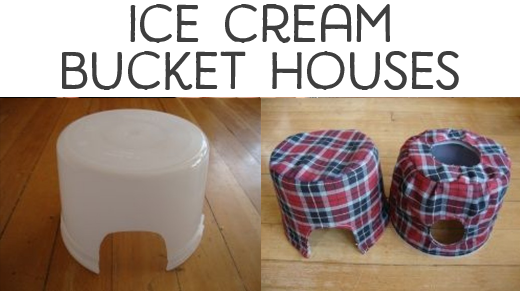 I like to sew simple covers for the ice cream buckets because it makes it darker inside, which the rats like, and it looks nicer. 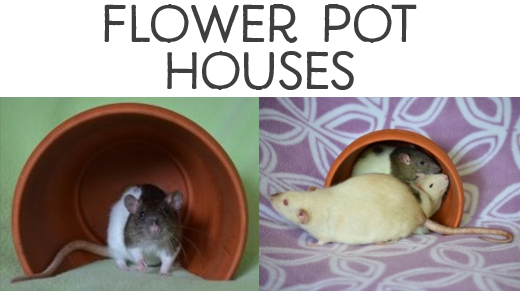 I think flowerpot houses are so cute, and my rats love to hide in them. To make the flowerpot house in the picture, my boyfriend used a grinder to cut off part of one side. This was to make it sit flat. However, if you don't have this tool, you could just turn a flowerpot on its side and keep it from rolling by partially burying it in bedding. Blow up a balloon to desired size. Make the glue by mixing together water and flour. I used about 1 cup of flour and 1 1/2 cups of water. I also used a few drops of food coloring in mine. Cut strips of white paper (the ink on newspaper is probably toxic) about 2 inches thick. Dip the strips of paper in the glue one at a time, squeeze off excess glue, and then smooth the strips onto the balloon, leaving a small opening where the balloon is tied. Once you have covered the balloon with a couple layers, leave it to dry for a day. Cut a bigger entrance hole. You could also cut extra doors and windows now. Punch holes in the top with something sharp, like a nail, skewer, or pen, and hang it up with rope. 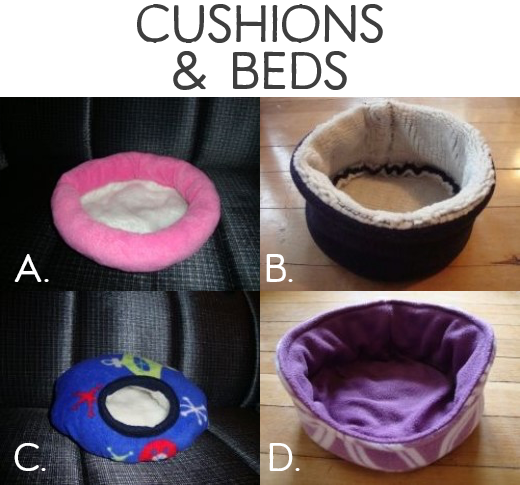 Fill it with crumpled strips of paper or fabric to make a cozy nest. Cutting a full balloon shape in half makes two different kinds of hideouts, as shown on the right. Pretty much everything in a rat cage is a chew toy, but you can make specially flavored toys that your rats are actually meant to chew on. 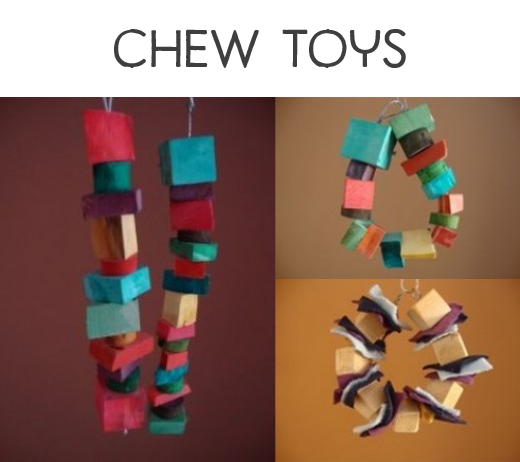 To make a chew toy, cut clean pieces of wood, drill holes through them, and then soak them overnight in apple juice with food coloring. Next, bake them in the oven on a low temperature. The baking not only dries out the wood but also kills anything that might be living in the wood, which is really important. Finally, string the colored pieces of wood onto flexible wire. You can also string pieces of fleece fabric and nuts on the wire, as I did for the toy on the bottom right. Note: This same method of soaking wood in food coloring and then baking it can be used for anything wooden in your cage that you want to add a little color to (e.g., ladders and domes as seen below). The food coloring will come off a bit when scrubbed and washed, but it should last for a while. Baby blocks make great, colorful chew toys for rats. For this toy, I simply drilled holes through the blocks and strung them onto flexible wire. Hanging the blocks isn't necessary; you could just place the blocks in your rat's cage. If you have the right letters, you could spell out your rats' names too! Note: Make sure that the blocks you choose aren't really old because the paint people used in the past had toxins in it. My rat Koko loves this one (I put it up a couple days ago, and she is still working on it). I drilled holes through a couple blocks of wood, some nuts, and some dried fruit. Then I strung them, along with a bell, onto a piece of ribbon. I hang this one up high so she has to work at getting it. To make this chew toy, I braided strands of fabric and threaded on pieces of wood (which I had previously soaked in apple juice) as I went. My rats especially like it when I tuck in little treats between the strands. This can also be used for climbing. There are several ways to make wooden ladders. 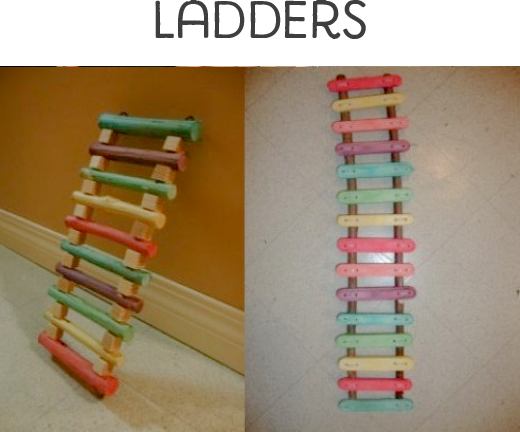 For the ladder on the left, I soaked the wood in water and food coloring, baked the pieces, and then strung them onto two pieces of coat hanger wire. Ladders can also be made by screwing or zap-strapping rungs onto two long pieces of wood (as shown to the right). Ladders can also be made out of fabric or rope (see fabric accessories above). Simple wooden houses can be made by tacking pieces of wood together. 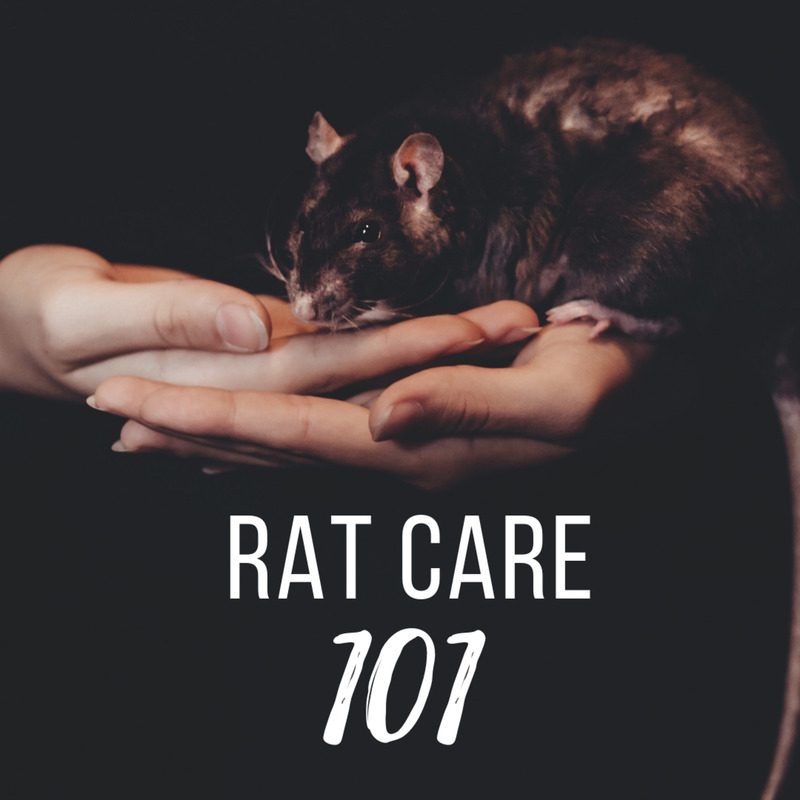 If you use wood glue instead of nails, you may want to use the house only in your free range area, where you can make sure that the rats don't chew and ingest any of the glue. (This is what I do with the popsicle-stick house shown below). Here are a few more houses to hopefully spur your imagination. For house A, My artistic boyfriend wanted to add a chimney and door trim to this house. For B, you can see one way that tunnels can be combined with the house to make things even more interesting for your rat. 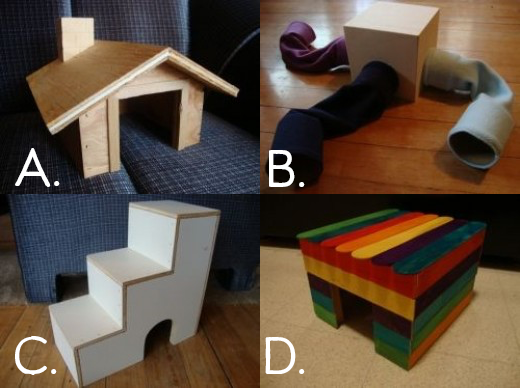 C is a wooden house that doubles as a staircase, and D was made by gluing colored popsicle sticks to a basic wooden frame. 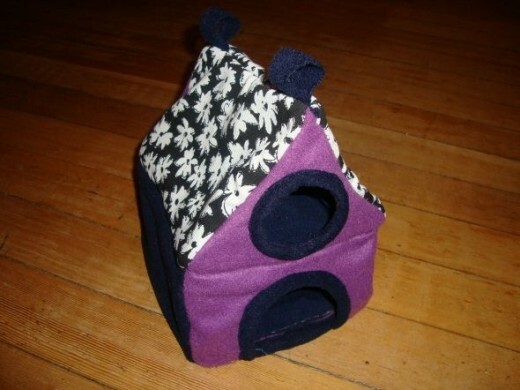 Because of the glue and dye, this is not a house that I would leave in the ratties' cage. I only use it in their free range area where I can keep an eye on them to make sure they don't eat it. However, you could dye the popsicle sticks yourself with food coloring and then use a nontoxic glue if you did want to use it in your rats' cage. Wooden tunnels can be made by cutting pieces of wood to a desired length, drilling holes in them, baking them to disinfect them, and then stringing them onto pieces of coat hanger wire. Tunnels can also be hung upside down to be used as tunnels or perches. However, they will probably get dirtier this way. To brighten up a cage, try soaking the pieces of wood in food coloring and water prior to baking. Rats love climbing on pieces of driftwood. They can be used in place of ladders to connect levels or just as fun climbing toys on their own. 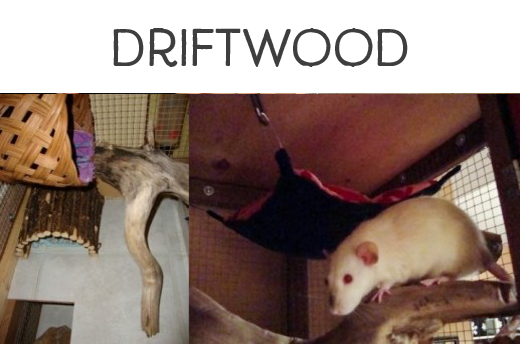 Before adding driftwood to your cage, make sure that you scrub and wash it well, then bake it to disinfect it. Hammocks, beds, ladders, etc. can be attached to your cage using mini carabiners, shower hooks, strong safety pins, or perhaps strong paper clips (although I have never tried this one). 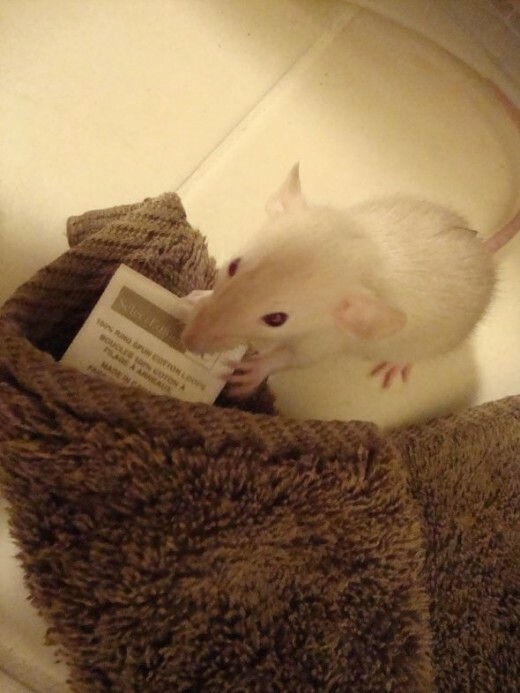 If you use safety pins, make sure you test that they can take your rats' weight because you don't want them to pop open and poke your rats. Zap straps (cable ties) work very well to attach more permanent features in your cage, such as driftwood, and are very cheap. If you want to attach something to the bottom of a wooden level or roof try screwing in small eye hooks (which can be done by hand) and then latching your carabiner to the hook. 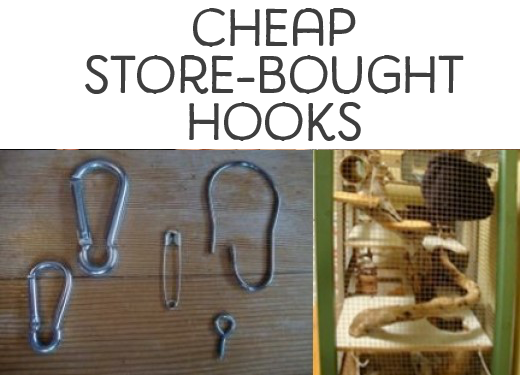 Of course, as this page is all about homemade things, why not try making your own homemade hooks? Just cut a small piece of coat hanger with wire snips and bend it with pliers into an s-shape as shown above. Hook the smaller top part of the "s" to your cage and the bigger bottom part to the loops on your accessory. Make sure that you bend the wire up enough that the loops on your accessory won't slide off. This is a great way to use up leftover scraps of coat hanger after making wooden domes or ladders. You can try making your own rat food mix. It's cheaper and healthier than store-bought mixes (but you need to make sure your rats get all the nutrition they need; you can't just throw together a bunch of stuff that looks healthy). 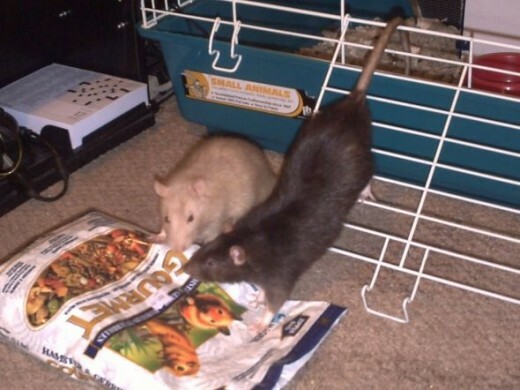 I feed my rats a staple diet of Harlan Teklad lab blocks, and supplement it with Suebee's grain mix recipe to keep the rats interested. My rats love these peanut butter banana oatmeal biscuits. I also got this recipe from Suebee, but I baked them for longer than it says to make them nice and crunchy. If you make a bunch, you can store them in the freezer. Try wrapping up treats in paper so the rats can have fun unwrapping them. You can also take a sheet of paper and put a treat in one corner and roll it up a bit, add another and wrap it up a bit more, and so on until you have a paper ball with lots of treats rolled up inside. For something more difficult for the rats, you can put treats inside a toilet paper roll and fold in the sides so they have to chew their way through. Here's a toilet paper roll filled with treats. I folded in the ends and wrapped it in paper. Hanging it up makes a fun rattie piñata. Find an empty spool of thread, and put a few small treats inside (e.g. Cheerios or Rice Krispies). Lay it on its side so that it will roll and add rats. The rats will have to roll it or dig inside it to get the treats to come out. This ball has a small hole in it so that treats can be put inside. The rats can smell them, but have to roll the ball (or chew through it) to get the treats to come out. It can also be hung up in a cage like a piñata. Blow up a balloon to the size you want (mini balloons work better, but regular ones work too). Cut thin strips of white paper. Make the glue by mixing flour and water in about a 1 to 1.5 ratio. If you want the balls to be colored, mix in some food coloring. Dip the strips of paper in the glue, squeeze off the excess glue, and smooth the paper onto the balloon. Continue until the balloon is covered with a couple of layers, but leave a very small hole where the balloon tie is. Allow to completely dry (which takes about a day). Pop the balloon and remove it. I found it worked well to pop the balloon with a needle and then to use a toothpick to peel the balloon away from the walls. Put some treats inside and give it to your rats. 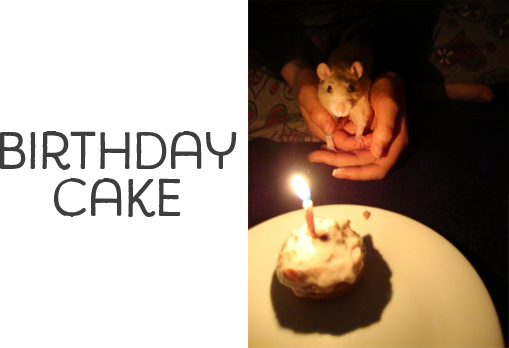 Rats don't get many birthdays so you should make them special. Delicious, healthy birthday cupcakes are easy to make. For my rats, I make banana muffins (you can cut down on the sugar given in most recipes) and then ice them with yogurt or jam. For sprinkles, I use seeds and raisins. 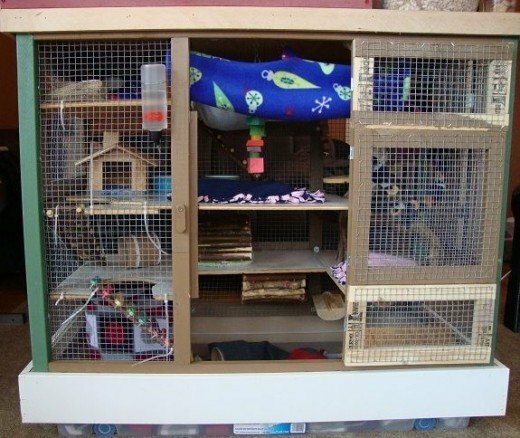 Would you try making any of these homemade things for your rats? Yes, they look fun to make! 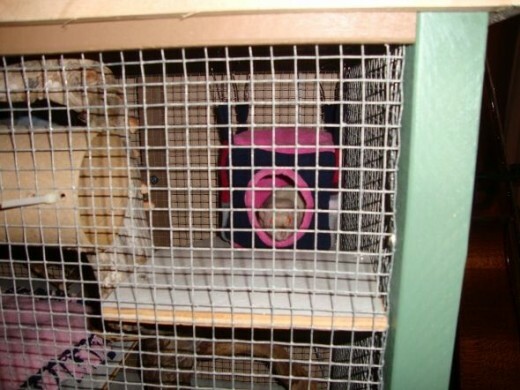 This is the cage we have now, which used to be two separate cages. Right now Koko has this gigantic cage all to herself, because her sister, Loki, just passed away. 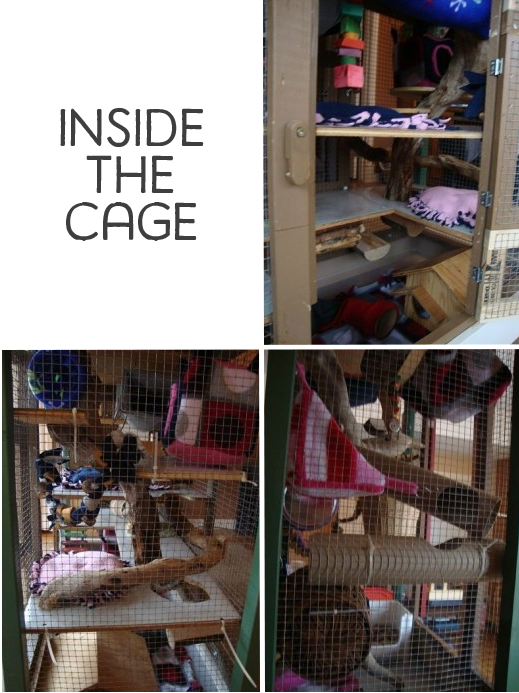 As you can see from the picture on the right, the top part of the cage is a big jungle gym. The bottom part of the cage has lots of levels. This is the very first cage we built. It was for Nimble and Mozie. 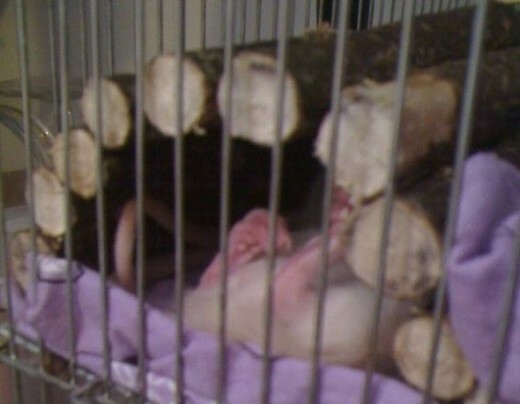 When they passed away it became the bottom part of our current cage. When Nim decided not to get along with the new rats, Koko and Loki, we had to build a separate cage for them. 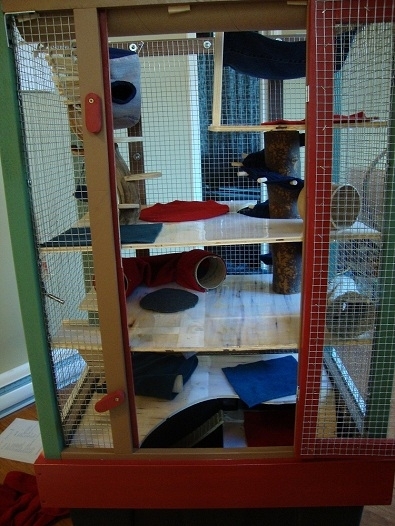 After Nim and Mozie passed away this became the top part of our current cage. We made this little cage out of the leftover material. It works great for travelling, or as a place to put the rats when I'm cleaning their cages. Hopefully, you have have some fun ideas of things to make your rats. Here you can meet my little ones. Koko is a special rat; we have a very close bond. 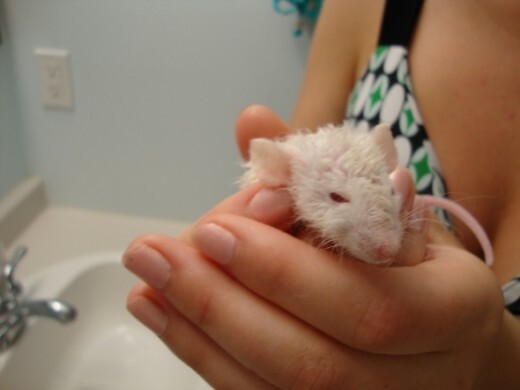 She is two years old, and despite having mycoplasma for over a year, she is a very strong, healthy rat. She loves exploring my house, especially when it's messy. She is very friendly and loves playing with me and being pet. She also enjoys snuggling on the couch. For three months she has lived alone, but I just adopted three new baby rats to be her friends (see below)! I recently adopted Piper and her sisters, Lily and Rue, from the SPCA. Their pregnant mamma was abandoned by a pet store, but then had been taken in by the SPCA. All the babies were raised in foster care, so my new rats are very friendly. They are now two months old. Piper is the most hyper of the three. She is the first one out for playtime and the last one back. She is very playful and agile. She enjoys climbing up and down ropes. Lily is the biggest of the three new rats. She loves fishing for peas and digging for sprouts in her digging box. She is often playing or sleeping with her sister, Rue. Rue looks a lot like her sister, Lily, but can be distinguished by a different pattern of spots on her back and a dark spot on her tail. Rue tends to be the most timid, but is still very friendly. She loves to play in my housecoat (while I'm wearing it). All three rats love their new big sister Koko, although Koko is still adjusting to their high energy level. I just adopted this boy! It has been a long time since I have had a male rat, but Jimi is such a sweetie. He is very friendly and affectionate. He likes to wrestle with my hand and to snuggle and be pet. Loki was my fuzzy teddy bear. She had adorable huge ears and looked like a baby her whole life. She was such a sweetheart. She passed away very recently, so I miss her a lot. Nimble was the most agile rat I've ever had. She could climb everything is my room. Because she was such a sweetheart, I gave her the middle name Thomasina after my extremely kind and gentle cat, who has since passed away. Mozie was my big teddy bear. She was clumsy, goofy, fluffy, and the biggest female rat I've had. She always tried to follow her agile sister Nim, but was not so successful in getting to those hard-to-reach spots. She was so much fun to play with. Baby Lu was only with us for a few short weeks before a sudden and unexpected death. I found her curled up and still warm, just looking like she was sleeping. 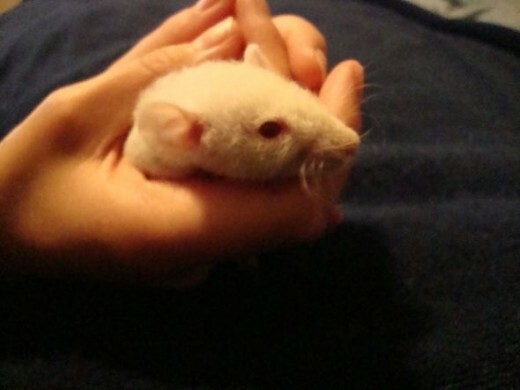 I was very sad to lose a rat so young, but I am glad to have had her in my life. 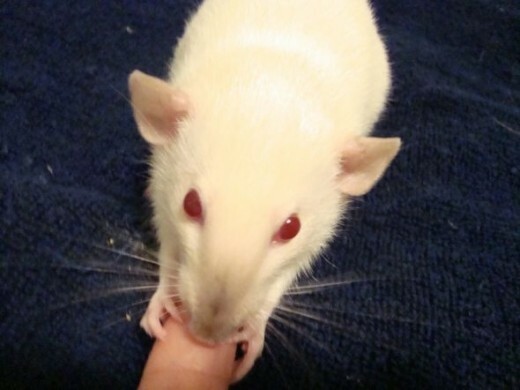 I think she was the softest rat I have ever had. 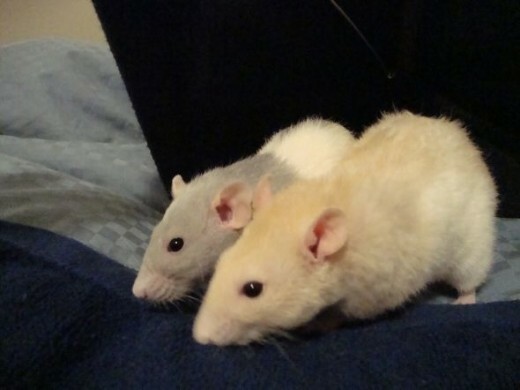 My only two boys: Milligan in beige, Radigan in black. I got these two as adults so I only had them for a short time. I am glad I could give them love before they passed on as they spent the whole first part of their lives in a pet store. A special thanks to my younger sister who adopted Radigan when I had to move. 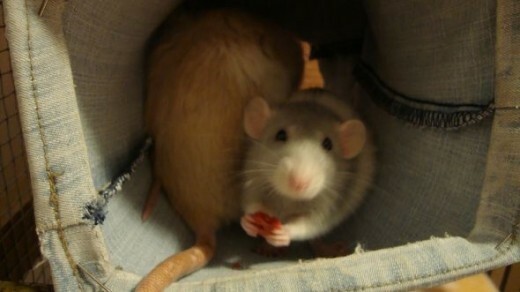 Ezzie was the second rat I had and loved her sister, Olly, dearly. Ezzie and Olly loved playing in piles of stuffies on my bed. Ezzie and Olly ignited my love of rats! Olly was my first ever rat, soon joined by her little sister, Ezzie. I only have a couple photos of these lovely rats because I didn't own a camera at the time. When you first start to train your rats, start off with teaching them their names. Take one rat out of the cage at a time when teaching them their names or they may get confused. Put the rat down a foot or so from you. Then, say their name. Example: "Rosie" in a sweet voice. "Rosie.... Rosie, come here, honey! Rosie." Hold your your hand with a treat and they will come. Stroke them and keep saying their name. "Good job, Rosie. Good girl. Good, sweet Rosie. Rosie my smart little ratty...."
Keep repeating this, moving farther and farther away from the rat when training. I need more detailed instructions for making rat toys, beds and ladders. I love my rat. I want to make babie's home a happy! We got our rats second hand. I think they're about 9months old...? I have no idea where to start on training them. 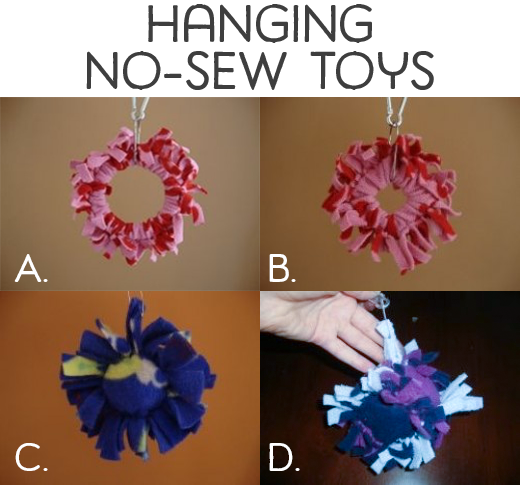 Could you please elaborate more on the hanging no sew toys? 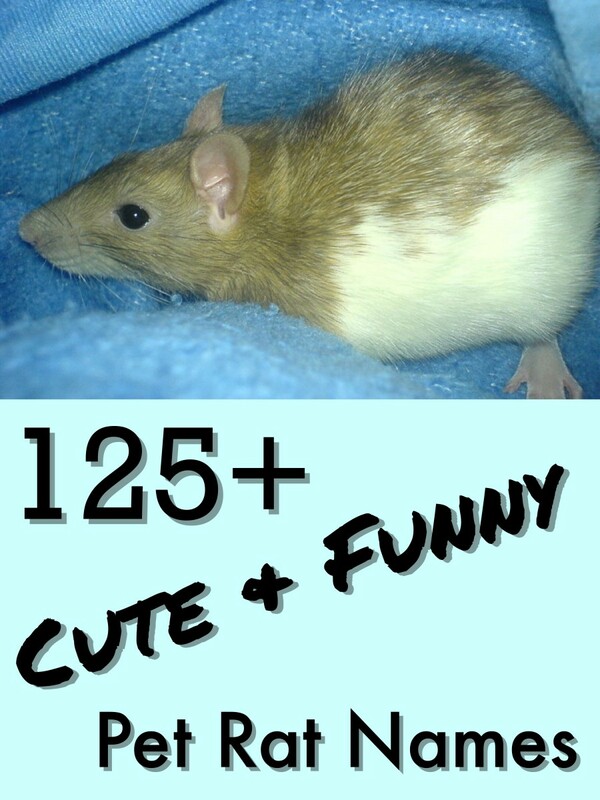 Amazing ideas , going to make loads up for my daughters birthday who sweetly asked for rat toys for her beloved pets . I have had may rats over many years, in my 50's now, and still have rats. 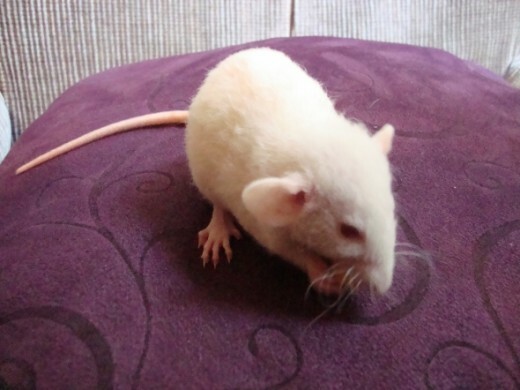 My son has a rat called SNOW, and she is the sweetest rat ever, I can wait to spoil her, thanks for sharing. 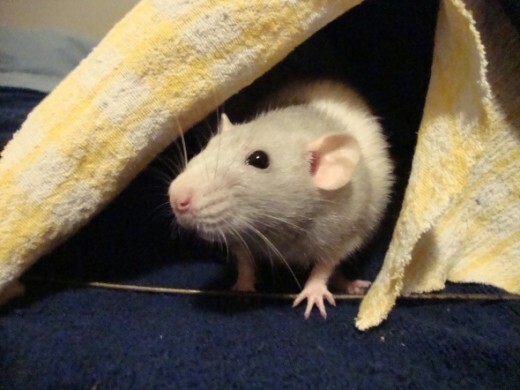 Hi, thanks for this blog it is so helpful, i am getting my first rats soon and so this was really helpful, I will definitely try some of these and i think they are all so inventive and imaginative ideas. 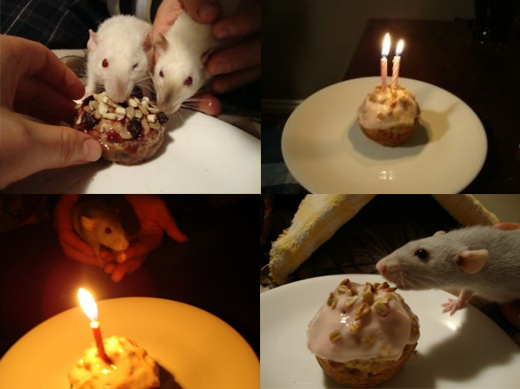 Thanks for spending the time to upload these and i will definitely be back to find out more about the little ratties. 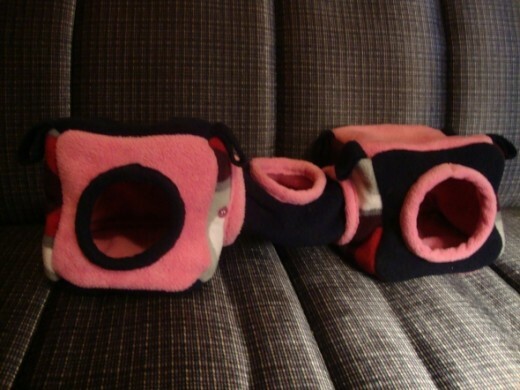 These are for ferrets so should I make them bigger ? Love the ideas. Can't wait to try them!!! 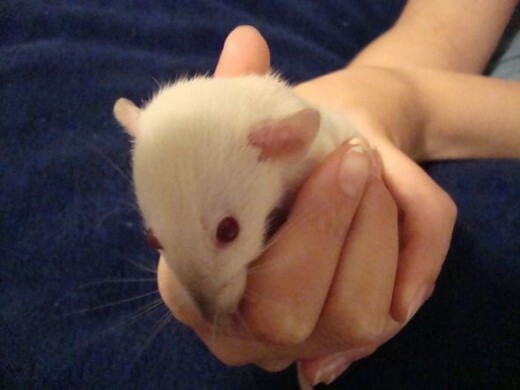 do you recommend buying rats from pet stores? This is so helpful. There aren't many things like this so I will treasure this insight. I have a large fancy rat named Melo. He is really loving and sweet. I have been feeding him what I thought was all really good food. Recently, while petting him I discovered dried blood spots, and a lot of them, around his neck. Just never petted his hair going against the grain!!! It is probably an allergy? I had given him, a few days earlier, the end of a fresh cob of corn, uncooked. Then a few days later he ate a tiny bit of corn from an eaten cob. The sites vary greatly in their advice about corn? Can you please advise? I buy Kaytee mix and he doesnt eat the dry corn in it? Anyway, I need to invent a healthy daily routine and would love any advice. Pretty Please. By the way, I am crazy about this site and the handmade goodies! 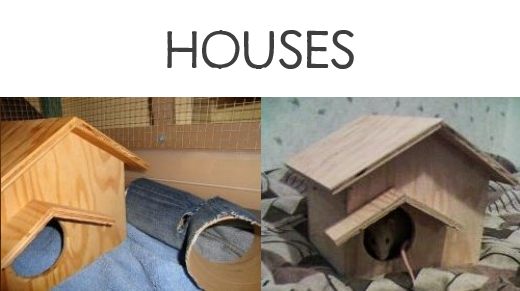 I use K-cup boxes for rat houses/ activity rooms, or cardboard boxes for the same. the rats seem to enjoy these, I have made my current rats, new hoses each week when I clean their environment. One of my FAVE posts. Thank you for all the ideas. This site is so cool I can't wait to start making some surprises for my rats Oscar, Felix, Scott, Zeke, and Sparkles. My pet gerbil Clover would also love some of these thing to destroy, she can shred a empty bot of cereal in a couple of days. I'm so happy I found this site while looking for help for my sick little guy named powder. He is our sixth rat in 3 years and I'm about to give up on getting them anymore. It's heart breaking. They get sick so quickly and been having problems with bumble foot. I thought I tried everything until i found this site. Your cage set up makes sense and so many things I never thought about. I wish I found this site a long time ago. Thank you for sharing this awesome info. I pray powder survives either way i am going to make a better home for him or another one. 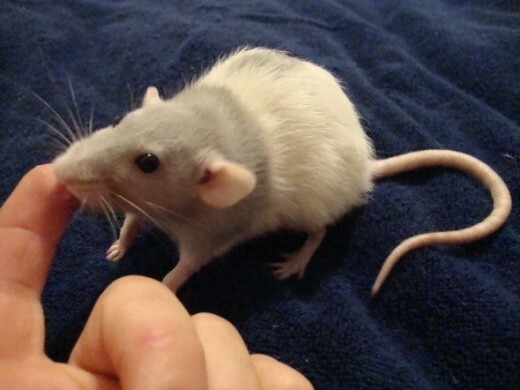 Your rats sure are lucky to have a mommy like you! 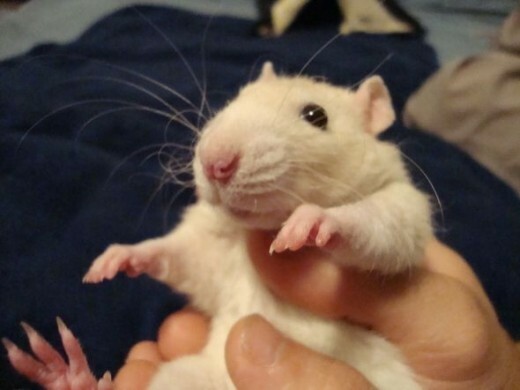 I'm trying to learn more about rats as I am a new volunteer at our local pet therapy program and will be travelling with them to hospitals, schools, anywhere we can connect people with animals. I too will be pinning your very helpful page!Thanks! Awe, I love your baby rattles!!! I have 3, currently. Thanks for the ideas, so cute. I'm gonna follow you on Pinterest. Oh my gosh, you are simply amazing and such a wonderful rat mommy! I got my first pet rats way back in my college days from the Psychology lab in college. Thankfully they didn't undergo anything too heinous, just lack of love and human companionship. I was hooked. I got my next 2 while active duty in the AF... I lived on base in the dorms but thankfully noone ever "ratted" me out about my little munchkins. Unfortunately, Helo passed quickly after I adopted him from the pet store, and I was so fearful of getting his brother Montague another buddy (this was 1997, and the pet stores advised against getting a "new" friend for him because they said he'd either attack a male or impregnate a female, and the Internet was had none of the info it has now), but little Monti lived to be nearly 5 years old before he eventually passed. Anyway, I wanted to get another pair but the ex husband wouldn't allow it. Now I'm with a great man who is considering it, but I needed a refresher concerning how to care for any new fuzzy friends, and at 0130 I stumble upon your amazing website! I could never have dreamed of such an amazing habitat for ratties! Seriously, I'm so excited to try to build my own rat paradise! Thanks so much for taking so much time to create such an amazing rat home, and for all the time you must have taken to provide not only pics but step-by-step instructions for others to replicate. I don't know if you know how much I truly appreciate it, as I'm sure others that stumbled upon your page must also. You've gotten me so excited to, after nearly 15 years, feel I'm finally able to adopt a couple rats and provide them a happy life! I cannot express how happy this site has made me. Thanks so much for sharing!!! hi yah all, my hubby and I built our own cage but need some ideas as to how to make it easy to clean, i noticed your cage didn't have any sort of bedding like aspen; which is what we use now in the smaller cage, i worry cause i want to make sure the new one is easy cleaned how can i make it that way? what do you do to clean the cages? I am wanting to build my own cage but have so many people warning me against wood. I plan on lining it with peel and stick laminate (warned against that too) with fleece on top (debating a velcro system). I see that yours is wood. How has this worked for you? have you had any issues other than that in your diy cage that you could offer any advice on? What a loving, creative and informative site! How wonderful of you to make your pets lives so much fun, and inspire others to do the same. I am just about to get my first rat babies on Saturday, and even though I went out and bought a heap of things, I will keep your site in mind to replace the loved to bits items. Thank you! I just got my first two rats a few days ago and have been looking up websites about their care and nutrition for happy healthy pals and this site is by far my favorite. I cant wait to start on the hammocks and upgrade their pen to a fun house for them. 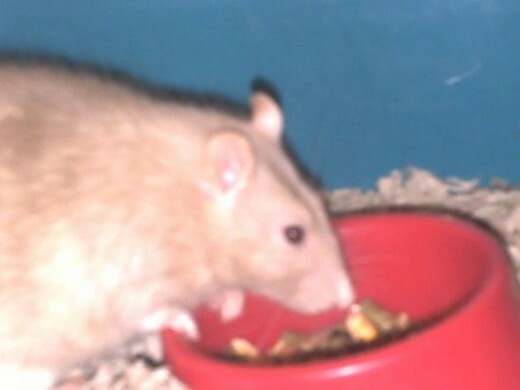 My pet rat of 3 years and 1 week died last Saturday :-(. I wasn't even sure I was going to get another one, no time soon anyway. Well, I got one yesterday. She's six weeks old, and still spends all her time hiding/sleeping. Her name is Bindi, and I hope she's as sweet as my last one. I love all that you have made. Your babies are so cute. I currently have 7 guinea pigs. I was wondering about the wood products that you have used. I would like to make huts and chewable for my babies. but you didn't put the specific types of woods you used. I know that there are just a few woods safe for guinea pigs. do you have any advice. Does the baking it and soaking it help? This is so helpful! I've used a lot of these ideas for my own rat cage. I'm about to get my first two rats, but with the cage you'd think I own my own pet store! Thanks again for this! How much did it cost you to make the cage? HOW did you bake the massive piece of drift wood??????? This is fantastic! I can't wait to start making some of these projects. Thanks so much for posting all of these wonderful ideas. Wow! Your rat accessories are so creative and unique - the best homemade rat things I have seen. I am soon to be a first time rat owner and I am doing everything possible to get prepared. :) I absolutely plan on saving this page, and trying to make some of these things myself. Your cages are awesome too! 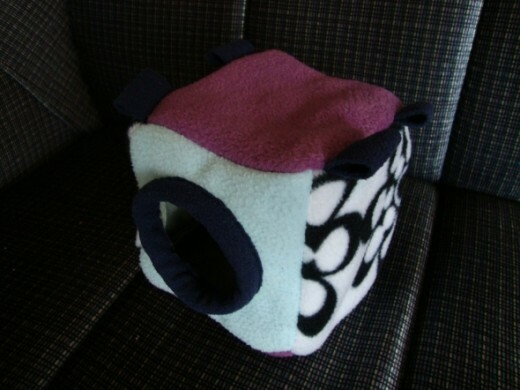 I've made cages for other small pets, so I'm feeling kind of inspired now to someday take on making a rat cage. OMG this is sooo amazing! Thank you for sharing! I've jut got my first two mice (which were being sold as snake food and I had to buy them to save them), so I'm quite new at this. Are these hammocks safe for mice too? I'm afraid the little girls will chew it and choke, am I being paranoid or can this really happen? And the wooden cage, can't they chew a hole thru it? Thank you again for sharing all this! Best regards, from Brazil. Hi, your ideas are really interesting! Can you tell me how you lined the hole you cut in the fleece hammock (in the first picture)? It gives it a real nice finished look. Thank you! omg this is an awesome website! 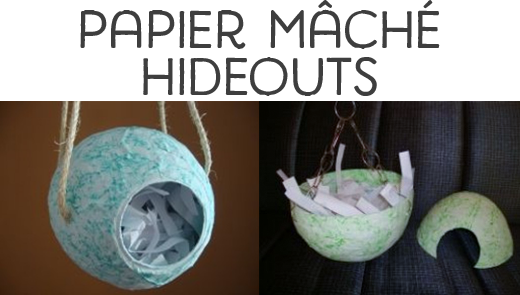 my rats loved the paper mache ball! Hi there, how do you make the two level house? Also is it okay to use pine wood for the chews? What kind of wood do you use for the chew toys? How do you make the 2 level house?? I am a non-profit ferret shelter and I make items for ferrets, but recently a lot of rat owners have been purchasing products from me. They have been asking for specific items and I have been searching for the perfect items for their pets. I found your site and I love your products, your beautiful rats and their stories! Thank you so much for sharing, thanks to you there will be so many more happy rats in the world. 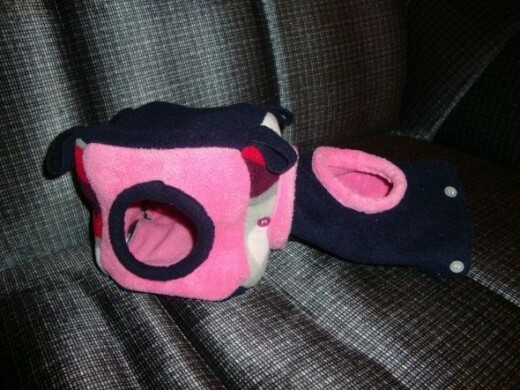 I can't wait to modify my ferret items to accommodate the wonderful world of rats! Excellent lens stuffed with so many good ideas. Well done!You're rats are soooo cute! @anonymous: Thanks:) And no, unfortunately I don't sell anything. There is a lot of competition out there and it would take the fun out of sewing for me. There are lots of people who sell hammocks and stuff on etsy or other sites though. I'm sure you could find something for a reasonable price. Good luck! @anonymous: Sweet! I'm glad it worked for you! Hope your ratties enjoy it! @JessyGene: Thank you for the speedy response :) I totally get it now, lol. After reading the tent instructions, I've decided to make my ratties a tent, too! Hi, thank you for this ... It's very helpful to new sewers like me, lol. How did you add the fleece trim to the hole entrance in the cube hammock? I miss having rats so much! 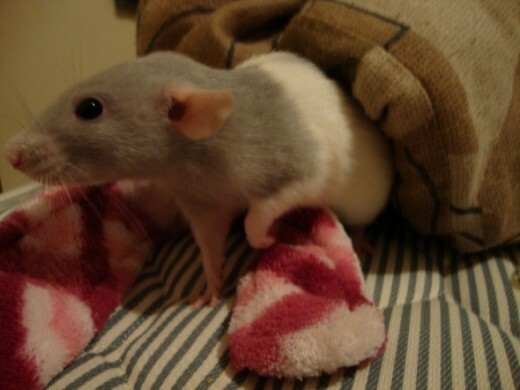 I used my old sweaters to make rat hammocks, too bad they peed on pretty much everything :( Your guys are adorable! @anonymous: they nibble a bit on the edge of the shelves, which is why I painted them with non-toxic paint. But I have other chew toys in the cage which distracts them from chewing the levels. 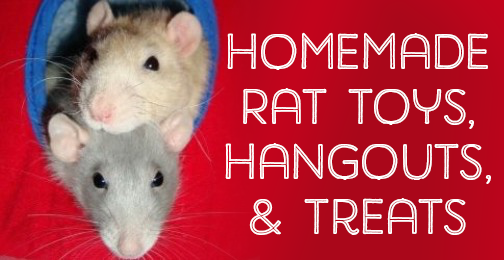 Rats will chew when they are bored, so having lots of variety and interesting things to do might help.Other than providing chew toys and fun things to do I don't really know of any way to stop rats from chewing hammocks. My rats tend to only chew holes in cubes or tents because they like having an extra door, but the flat hammocks get left alone. I think some rats are just bigger chewers than others, and some grow out of it as they get older. If your rats are chewing the hammocks down by the corners, you could try using grommets and thin chain from the hardware store to hang the hammocks since they won't be able to chew through those. I guess if your rats are big chewers then try to just buy really cheap material from second hand stores. That way it's not a big loss if they shred the hammocks. You could also maybe try using stronger fabric like jean, just make sure you snip any fraying edges so your rats don't get tangled in them. @JessyGene: Do your rats chew the wood selves? And do you know haw to get your rats to stop chewing up stuff like hammocks. Thanks. @anonymous: It's wire mesh screwed to a wooden frame. Because the mesh completely covers the inside of the cage the rats can't chew the wood. @anonymous: I sewed that one a long time ago, and I remember it being kind of difficult (but I was very new to sewing at the time). Unfortunately I didn't take pictures as I was making it so I can't show the steps right now. I'll look into sewing another one so I can show the steps, but I've been busy with rat intros so I'm not sure exactly when I'll get to that. I haven't sew in a while so hopefully this will get me motivated again! @anonymous: Awesome! 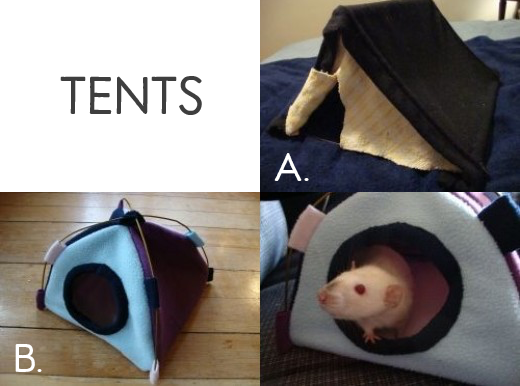 Tents are still one of my favorites, and everyone who sees them loves them (including the rats!). They really aren't much more difficult than a cube, but they just look so cute! Thank you so much! I've made the tent and my ratties love it! i am getting rats soon and these are great ideas! I love all of the things you can make for rats. Blessed! Boy, are your mice spoiled! Really cute ideas. When my kids were little we had five mice (2 at a time, usually), 2 gerbils and a hamster at various times. Loved the little buggers. They were so much fun to watch and play with. @MaryThereseBenn: Thanks you. :( She was a real sweetheart, and is greatly missed. I bet you have rats just lined up at your door, asking to be let in! 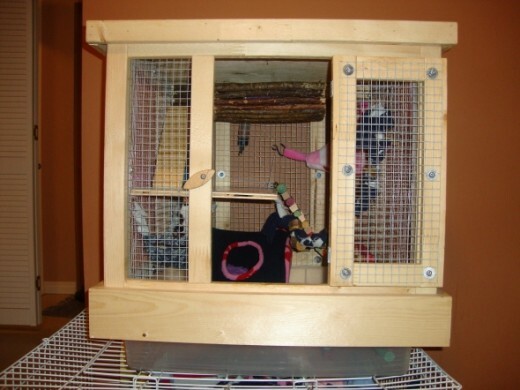 Your homemade rat cage and all your adorable toys look like so much fun. It's obvious your rats are very loved. Great lens. Thanks for taking the time to put it all together and your pics are lovely. Hi I enjoyed your lens, lot of nice pictures. I'm sorry for your loss of Loki. :( Your pictures are neat! It's wonderful that you love rats so much. They are lucky to have you. You give them the most awesome homes. I've never seen rat homes as elaborate as yours. Kudos to you for your passion and your humanity. Brilliant lens! Kudos to you for having so much love for these adorable little creatures that most people seem to think are creepy. Congratulations on LOTD. I love ratsies, too, and I love, love, love this lens! 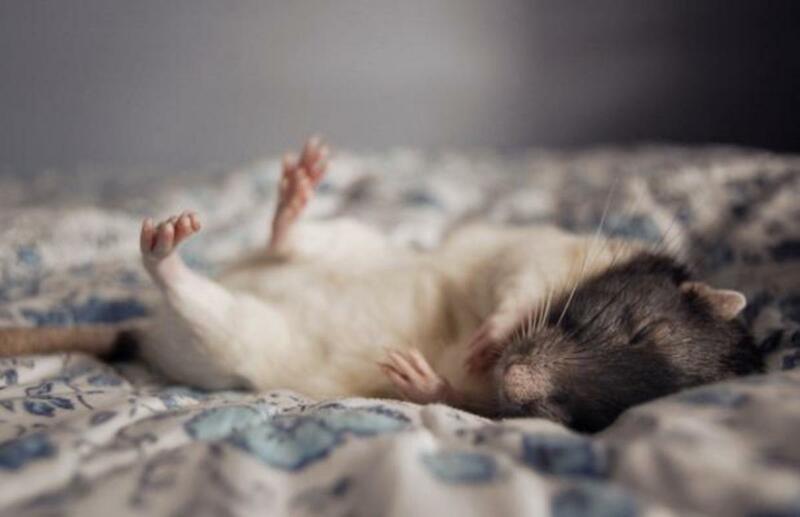 Seeing the photos of your rats along with your comments introducing them was incredibly sweet. Thanks for starting my day on such an uplifting note! WOW! 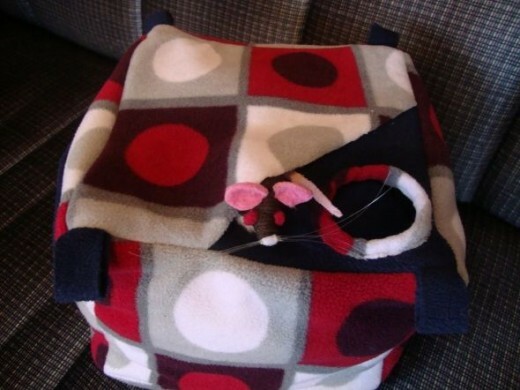 You've got so many great crafty ideas here for rat toys and furnishings. Your rats look like they're lots of fun and they are cute. I have cats that might actually not bother them except to try to play but then again, I wouldn't want to take that chance. I'll send this to my daughter for her little rodent buddies. 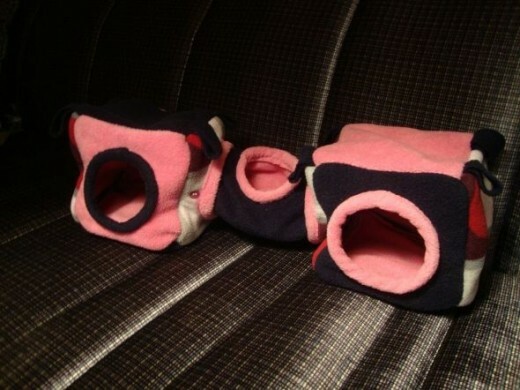 Not a rat person, but thinking of trying a larger version of one of the beds for my JRT! My sister always raised rats and we got very attached to them. Our cats never bothered them. I enjoyed your lens very much. Congratulations on LOTD. Excellent collection... I Was looking for some homemade things for my Degus, and this applies for them as well. I am so glad you shared the photos of your pet rats. My sister had a white rat with red eyes when we were kids. She loved him so much. A very nicely written lens from the heart. Wow! This is awesome. You are just so creative! Very cute rats! Thanks for sharing this article! Rats are intelligent animals and make good pets, but I can't have any, because I keep pythons! Very good lens with some great ideas. I can alter some of these for my snakes. Congrats on LOTD, this is a really well made page. I am not into rats or pets at all really all that much, but it made a great read with all those pictures. Well done.